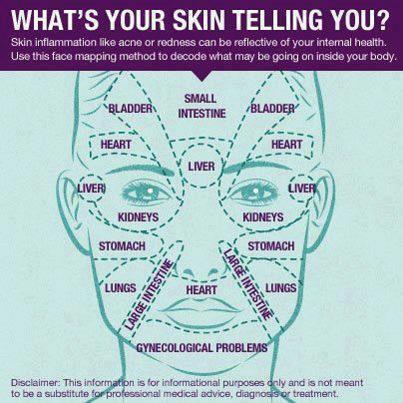 This chart is really cool, and a good reminder that what goes on in the rest of your body affects your skin. Everything in your body is interconnected. What you put into it, and how you take care of yourself, will show up on your face. While it's fun talking about different skin care and makeup (really, really fun), and important to find safe products that won't break out or irritate your skin, there's only so much you can take care of on the surface. The real work has to be done from the inside out. The best thing you can do for your skin is to lead a healthy lifestyle. You know the deal: eat well (meaning whole, nutritious foods), drink lots of water, get enough sleep, exercise regularly, get some fresh air and sunshine, and minimize stress. Sounds easy, right? Just remember--baby steps. But, we do want to start addressing the diet and lifestyle component to having healthy skin on Those Pore Girls, because what you put on your body is not nearly as important as what you put in it. And to those of you struggling with cystic acne: these are the kinds of things you have to work on, not your skin care routine. Even if you have acne as a result of hormonal imbalances, those can also be sorted out through eating right and taking care of yourself. Often, people get acne because of allergies and reactions to food (especially dairy and gluten). Everything is interconnected! Food for thought. By the way, if you want to get started on reading about all of this stuff, we highly recommend checking out The Love Vitamin. Tracy's blog is amazing, thorough, and inspiring. You can read all about her journey to healing her skin through making changes to her diet and lifestyle, and get some seriously awesome tips for yourself, too. (You guys, she doesn't even have to wash her face anymore!) Otherwise, stay tuned.